How Chinese Students Shocked the World with a Magnificent Movement for Democracy and Liberty that Ended in the Tragic Tiananmen Massacre in 1989. Relive the history with this blog and my book, "Standoff at Tiananmen", a narrative history of the movement. 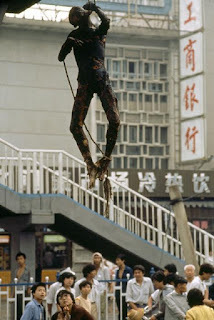 The burned and lynched body of Liu Guogeng (刘国庚). The burned and lynched body of Cui Guozheng (崔国政). 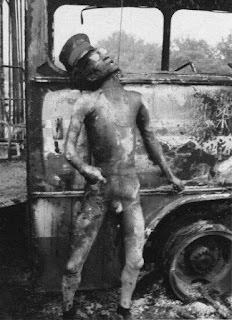 The burned and lynched body of Cui Guozheng. 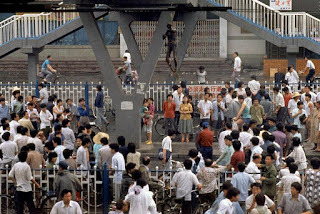 In 1989, students in Beijing, China, rose against the tyranny of their own government. In the short span of two months, the spectacular movement evolved from petitioning to loyal opposition and then, in the face of military suppression, to seeking a change in the communist regime. This book is a narrative history of that magnificent time when they experienced joys of mass demonstrations, sorrow of a prolonged hunger strike, disillusionment with their own rank and file, and the deep anger over a massacre. It is a compelling human story that is being told for the first time. Excerpt: Chai Ling's "Last Word"